The GWA Fencing Club competes in tournaments sponsored by the On Guard High School Fencing League of Georgia. In November of 2017, the club participated in its first competition in Flowery Branch, GA. Freshman Evelyn Echols won a silver medal in the Women's Epee event , which featured 20 competitors from five high schools. Juniors Odile Vidrine and Tatiana Bolds tied for a bronze in the Women's Saber event, which included 11 competitors from four high schools. Alana Thorpe turned in an excellent performance in Women's Epee. The club meets Mondays from 3:15-4:45 in the cafeteria and is open to all GWA high school students (middle schoolers are welcomed, but cannot compete in the high school fencing league tournaments). Students can choose from three types of swords - the foil, the épée and the sabre. The first lesson is free and the coach can loan all necessary protective equipment and weapons. Anyone interested should contact Odile Vidrine (junior), any Fencing Club member, or email Mrs. Maureen Vidrine..
At the On Guard High School Fencing Club tournament at North Gwinnett High School, GWA's Evelyn Echols continued her amazing season in Epee with another silver medal (pictured above with club coach Allen Schneider). Echols, a freshman and new to the sport, competed against 20 other female fencers from four other high schools. 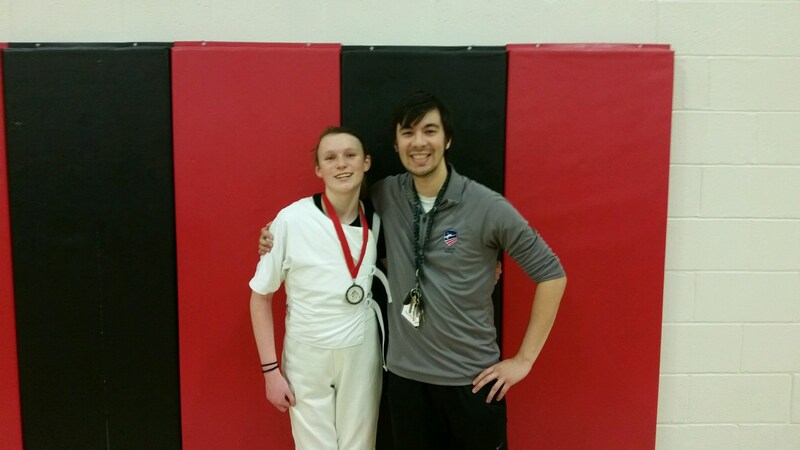 Odile Vidrine, a junior, took bronze in Saber (shown below in photo with Coach Schneider), competing against nine young women from three other high schools. Both students, along with club member Tatiana Bolds, are eligible to compete in this spring's championship tournament. The club is actively recruiting new members- anyone interested please contact Odile, Evelyn, or club mom Maureen @mvidrine@brenau.edu. Coach Schneider started fencing in 2005 with Olympic coach Arkady Burdan. He started at the age of 14, but quickly became hooked on the sport. Just after over a year of fencing, he quickly obtain a "B" rating and was able to attend a cadet world cup in Poland after just 1 year of fencing. Later on, Allen obtained his "A" rating in 2008 and consistently being top 16 on the national points list for cadet and later in junior. Allen was later top 24 in the country in senior rankings (top 4 are generally Olympic fencers). GWA capped off a phenomenal maiden season with a strong showing at the On Guard High School Fencing League Championships. Freshman Evelyn Echols finished fifth in the championship match for Women's Epee and was fourth for the overall season rankings. Odile Vidrine earned a silver medal, finishing second in the championship match for Women's Saber, and was third in overall season rankings. GWA earned a trophy for third place in "Women's Saber Team" for the season, thanks to the combined contributions of Odile and junior Tatiana Bolds. Fencing began as a form of combat and is known to have been practiced well before the birth of Christ. Relief carvings in Egypt, dating from approximately 1190 BC depict fencers competing. As a sport, fencing began in either the 14th or 15th century and both Italy and Germany lay claim to the origins of the sport. In 1570 Henri Saint-Didier of France gave names to fencing's major movements and most of that nomenclature remains. From the 16th to the 18th century, sword ﬁghts and duels were common. In the modern age, fencing is a safe sport that develops strength, balance, body awareness, and self-confidence, in addition to being a lot of fun! Fencing was introduced during the 1896 Olympics and is one of the few sports to have been contested at every Olympic Games. Women's fencing ﬁrst appeared in the Olympics in 1924. Fencing was one of the few sports that admitted professionals prior to the 1980s. Today, men compete in both team and individual events at the Olympics using three types of swords - the foil, the épée and the sabre. Fencing was introduced at George Walton Academy by Patti Miller in 2011. Photos from that time show Patti with a sizeable group of students at a Fencing camp held at GWA. In 2016, Odile Vidrine began exploring a Fencing Club at George Walton Academy, which was approved to begin in the Fall of 2017. Odile began sabre fencing in early 2014 with Freeland Abbott, who fenced at the Massachusetts Institute of Technology. By Fall of 2014 she entered her first tournament, held by Allen Schneider who later became her fencing coach and then GWA’s as well.